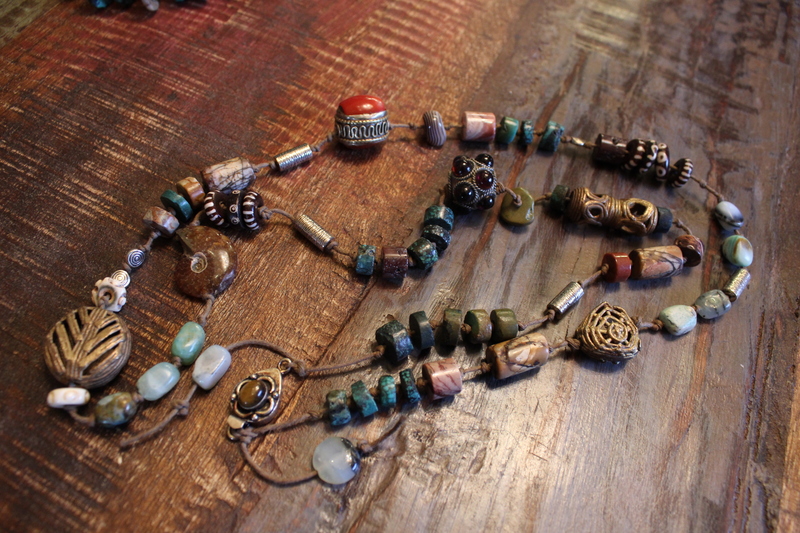 Oklahoma artist and jewelry maker Shaun Collier’s personal style is reflected in her jewelry. 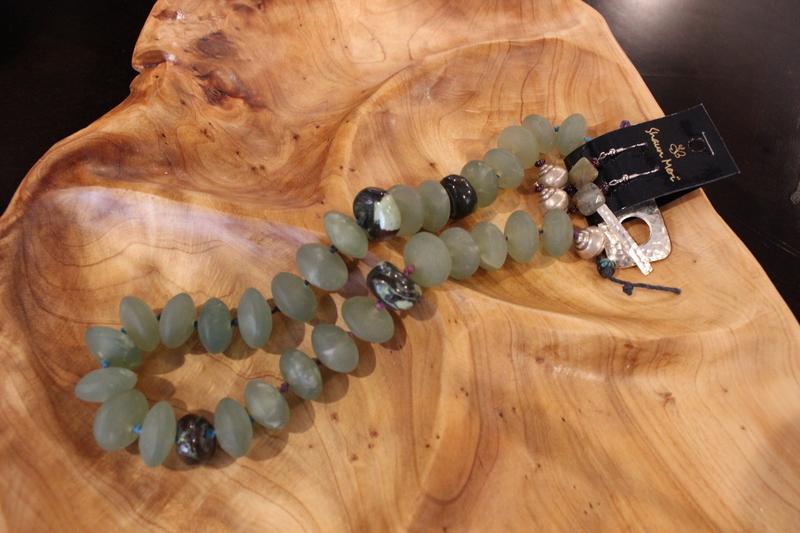 Both elegant and down-to-earth, Shaun Meri’ Jewelry pieces are the marriage of these two styles. The results are unique and versatile jewelry pieces that may be worn with both casual and formal attire. 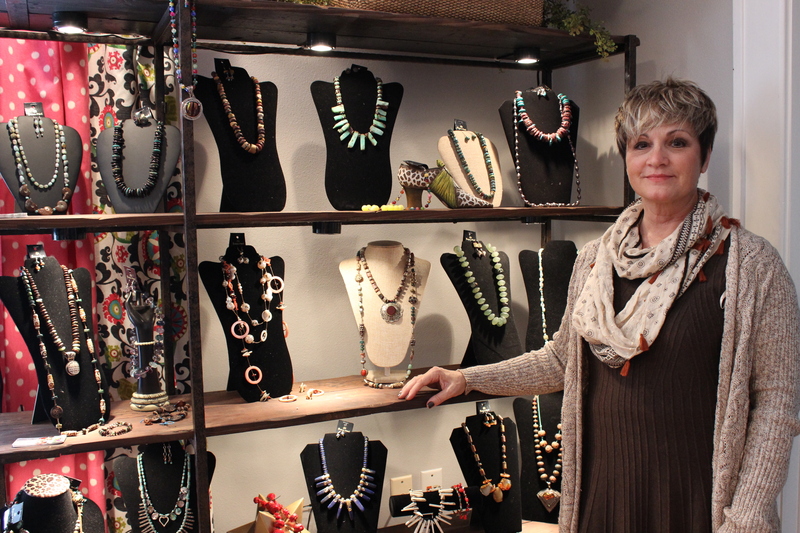 In her creations, Collier utilizes beads made of both natural and man-made materials purchased at regional bead markets in Tulsa and Dallas. Over the years her style has changed a lot. She said she has learned to self-edit her designs so that the pieces are lighter in weight. “I try to wear it and see if it’s comfortable. If it’s not comfortable I take it apart. Sometimes people will feel it and say, ‘it feels heavy;’ you just have to put it on because if the weight is even all the way around, it doesn’t pull,” Collier explained. 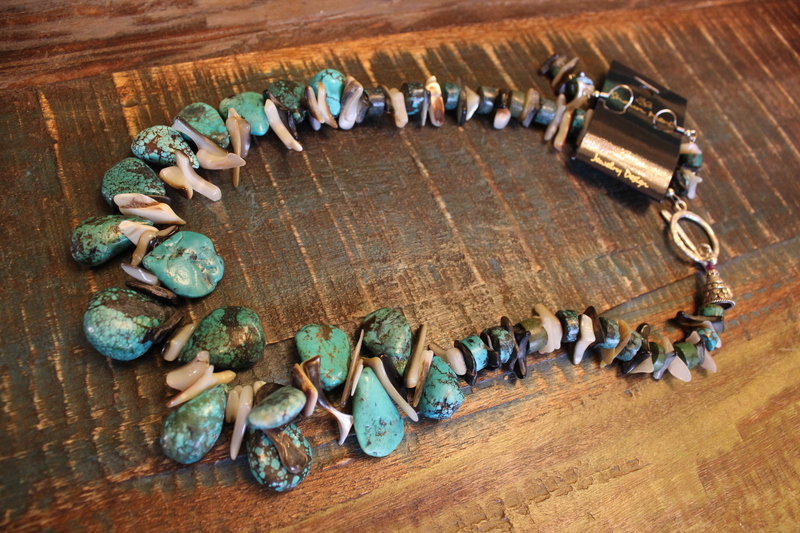 She showed me one of her favorite pieces, a turquoise necklace with shells. “Turquoise goes with everything,” Collier said. In creating this piece, Collier explained, “it takes a lot of time because you have to knot each one.” The time it takes to create each knot increases the price. In pricing her work, Collier endeavors to balance cost of materials and time, so that they remain affordable. One of her most expensive pieces was $450. 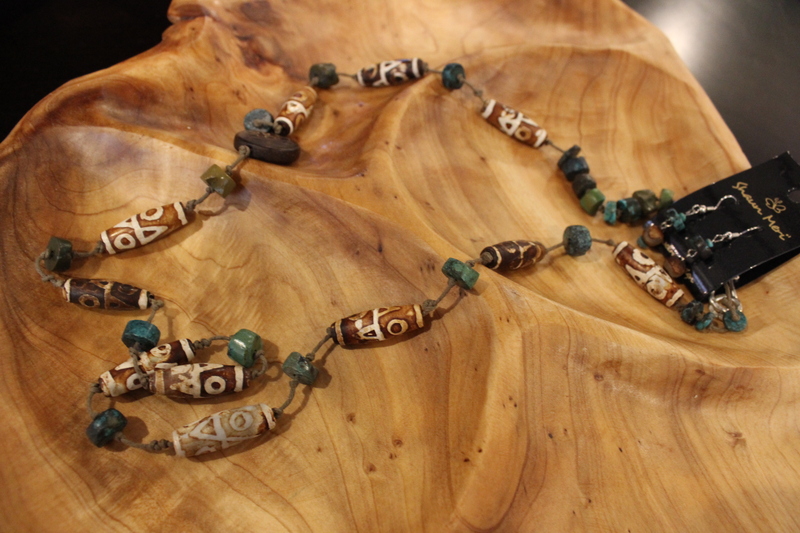 When Collier created the piece, she said, “If it doesn’t sell, it doesn’t matter to me because it was the most beautiful shade of green with a little bit of turquoise here and silver with a beautiful clasp. It wouldn’t hurt my feelings if I still had that one,” she confided. Collier became interested in jewelry design quite by accident. 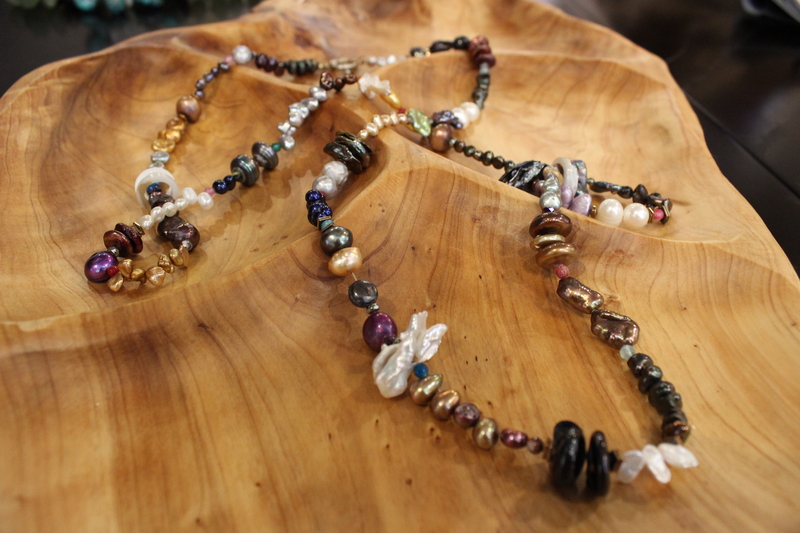 In 2008 or 2009, Collier accompanied her mother, artist Narda Caton, to Tulsa to visit a bead market. The beads she saw there were so beautiful that she began envisioning what she could create with them. Soon, following in her mother’s footsteps, Collier also began making her own pieces. About a year later, while filling in for her mother who was one of the vendors at Woolaroc Ranch and Museum’s Cow Thieves and Outlaws event, Collier offered her jewelry to the public for the first time. “To my mother I said, ‘let me take your jewelry,’ and she said, ‘bring a few of your own too’, and so I did. Several of her pieces sold and several of mine sold and that kind of gave me the bug,” Collier explained. Collier continues to offer her pieces at Woolaroc’s annual Cow Thieves and Outlaws event and select jewelry pieces are at Sweet P’s Gift Shop in Bartlesville. 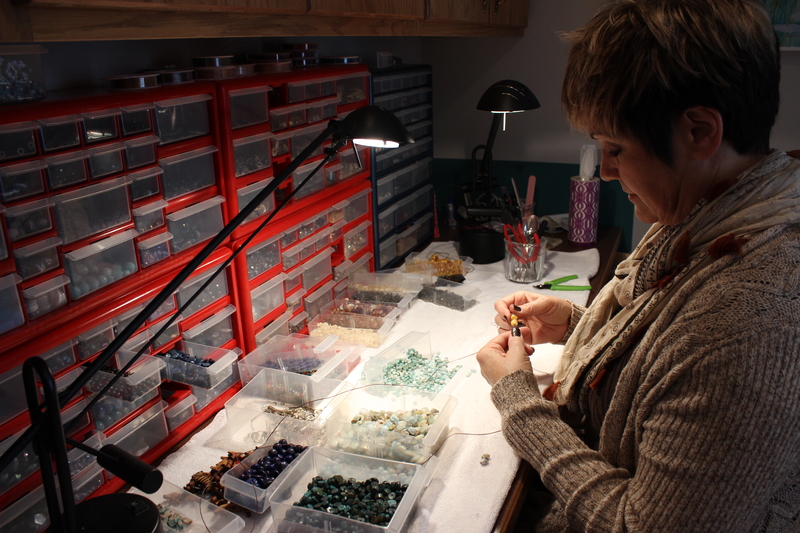 Individual jewelry appointments are available by calling Collier at 918-214-1591.